A great passion for the sea. This is the spirit that underlies Italcanna’s marketing philosophy. A passion inherited from the founder of the company, Carlo D’Olivo, and started when he was a boy and worked in his uncle’s factory where, in the early post-war years, over 120 employees manufactured hexagon split cane and bamboo fishing rods. Today, Italcanna is known throughout the world for its excellent products which hold several records for catching big fish on all seas around the globe. All this was unimaginable back in the mid-60s, when the name Italcanna made its appearance on the first rod blanks which Carlo D’Olivo manufactured personally. 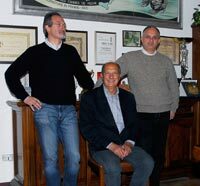 And many years have passed since that far away 1966, when the new company, still run by the D’Olivo family, was set up. The production facility is based in Segromigno, in the province of Lucca, a few kilometres from the Tyrrhenian Sea. The whole company’s production, which offers a choice of over one thousand products, is designed to mainly cater for sea fishing needs. For many years, the company focused primarily on the production of fibreglass rods, which were first exported to France and later to the United States and Australia, and within a few years received important acknowledgements such as the Quality Award in 1971 and the Gold Hercules International Award in 1981. In the 80s, after extensive research on the application of composite fibres in the sport fishing sector, Italcanna became one of the first European fishing tackle companies to manufacture hollow composite blanks. Using woven carbon also for other applications, the company developed new manufacturing and assembly technologies to obtain ultimate performance from composite materials. The results achieved were excellent and the new materials were introduced on the entire production expanding the company’s range with innovative, cutting-edge products. These research activities led to the development of the first micro-fibre tubular trolling rods, which immediately won a world title at the 1981 Madeira World Fishing Championships. In addition, as a result of these studies, the solid fibreglass rods, which were becoming outdated, were superseded by the first telescopic surf rods, such as the TeleSurf and Marenostrum (trademark patent dated 11/11/1986). Despite these successes, the company did not rest on its laurels but continued to introduce innovations, such as the TMH patent (22/10/1987) and the production of a range of specially-designed, high-performance long casting rods. The technical experience acquired with the limited production of this special rods was later applied to the series manufacturing of surfcasting rods with outstanding results. The Evoluzione surf rod alone, for example, revolutionised the surfcasting style both in Italy and Europe by introducing a solid carbon tip which halved the rod tip diameter while doubling the sensitivity. Another innovation introduced by Italcanna was the first surf rod without running guides on the top section which was specially built for an Italian customer in 1998. In more recent years, Italcanna patented the CarboTitanium (13/12/2002), a material designed to give surf rods extra strength and lightness. Due to their quality and reliability, Italcanna rods are often used in fishing centres for heavy-duty applications, such as catching fish over one thousand pounds at great depths or fishing for sharks from the shore. Over the years, these achievements have been crowned by several records established by faithful customers who have been relaying on Italcanna products for over three decades. Every Italcanna rod is designed to give you some of the most unforgettable angling experiences, whether you fish the ocean, the Mediterranean Sea, or just try to target those little fish swimming near the shore. But Italcanna also means “Gladiator”, the popular range of trolling reels. Like the rods, these reels are built using the finest materials and the most advanced technology, making them the perfect match for any trolling, drifting or stand-up rod. 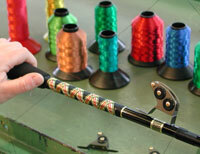 Finally, Italcanna means the exclusive distribution of the renowned US brands Ande, Eagle Claw and Scotty. Known worldwide for its outstanding performance, the Ande monofilament fishing line meets IGFA strict standards and world record requirements. Eagle Claw and Scotty are leaders respectively in the production of quality hooks and boat downriggers. Last but not least, we should not forget Italcanna’s ongoing commitment to promoting and spreading sport fishing in Italy and to protecting the environment by using eco-friendly products and health-safe varnishes and paints. The sea and the fishing… an inseparable match for Italcanna, which continues its adventure always looking at new and ever more challenging goals to be achieved. Italcanna guarantees that all rods featured in this catalogue are completely made in Italy within its production facility in Lucca, including the carbon fibre from which each single blank is constructed. ‘Made in Italy’ means not only using the best of materials, but also providing service and spare parts, including for older products. To this end, we keep all moulds and dies that are necessary to manufacture a particular item. Italian-made also means that the product you are using has been developed by expert anglers specifically for our sea conditions and our fishing techniques and is not necessarily suitable for water conditions in other countries. As we have a direct relationship with the end users of our products, we make it our duty to always use the best materials. Unlike other manufacturers who supply their products to global companies and, consequently, are merely interested to offer average-quality products at lower costs without taking responsibility for the raw materials they use, we will answer for the quality of our materials at any time. A clear example of this is illustrated in the chart alongside showing the various types of HR carbon fibres. As can be seen, all types of HR fibres shown therein have a similar modulus of elasticity, but different tensile strength values. This means that a rod made from A-class carbon fibre (our choice) will have the same weight and stiffness as a rod built with C-class carbon fibre (less expensive). But, while the two products appear to be virtually identical, when subjected to a high tensile load, the C fibre will break long before the A fibre does. Italcanna relies on a highly-experienced skilled staff to manufacture each and every product to the highest quality standards. Our machines are continuously adjusted and tuned-up to achieve the best processing results. Nevertheless, much of the work, such as the Greek key pattern on the trolling rods, are still being made strictly by hand. Likewise, guides are hand wrapped and secured to the rod via a unique system which makes them integral with the blank, keeping the wrapping from loosening and coming apart over time. A pull at one of the guides will reveal how tightly gripped they are. As regards the rod blank, we are proud to point out that each of our blanks is purposely designed and constructed to match a particular type of rod with a specific casting weight for optimum performance, while several non-manufacturing companies will often cut the rod tip to vary the casting weight in order to reduce stocks. Building a fishing rod requires an extensive knowledge not only of composite fibres but also of metal working, gluing and painting techniques. Italcanna also produces its own patented self-lubricating guides. Made from an ultra-strong anti-scratch, corrosion-resistant alloy, these guides feature an AISI 316 stainless steel roller for smooth line travel (see detail of guide assembly in the photo). Each new product we bring to the market is the result of extensive design activity and severe testing that may require several months. This is why each of our products is developed with innovation and durability in mind. Therefore, we have no interest in creating ephemeral or defective products that would have to be discontinued the next season. This explains why best-selling products developed some years ago are still on sale in fishing tackle shops around the world. This proves that Italcanna products are truly innovative and bound to last long, and acquire thereby a commercial exchange value that remains unchanged over time.